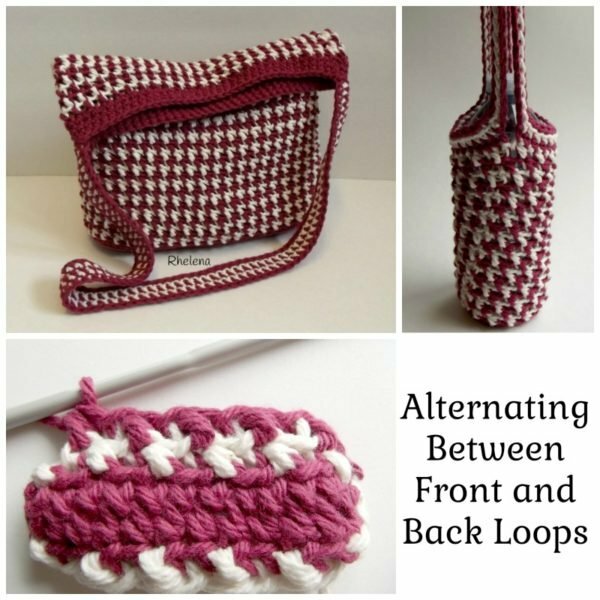 Someone asked if I would do a video showing how to alternate between the front and back loops as I had done in the Alternating Bag, the Alternating Water Bottle Holder, and the Alternating Chunky Beanie. Unfortunately I am not able to do videos at the time, but I thought a photo tutorial might be helpful. For this stitch I used the half double crochet and slip stitch and alternated them between the front and back loops. 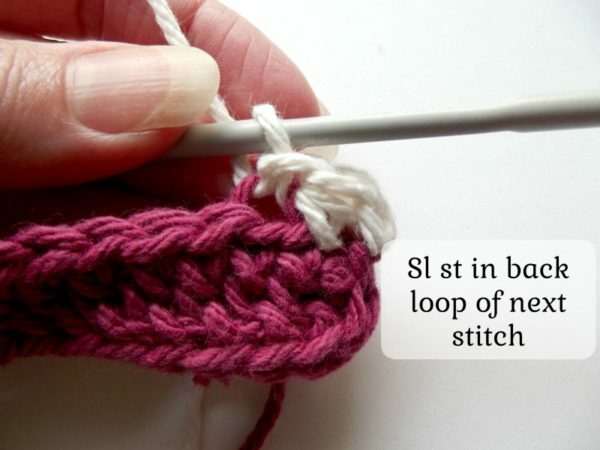 It’s a very simple stitch, but it results in a beautiful texture and color pattern. 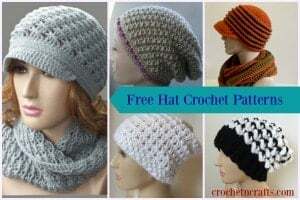 My biggest issue with this stitch pattern was to crochet the first stitch in each round. I found it quite difficult at first to insert the hook into the front or back loops only. But with time I learned to wiggle the hook and also to keep the first stitches on the loose side. So it does get easier with more practice. 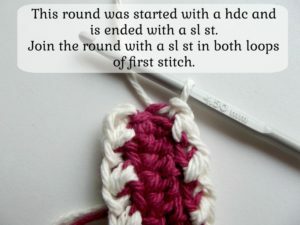 Another thing with this stitch is that it can only be worked in the round! Of course you can work it in rows too, but the texture is completely different. I did a small swatch in rows, but I ripped it out as I liked this one better. And now I can’t remember whether it was a go or no-go! Silly me, but I will definitely do another and see what it looks like. And just to clarify, this is not the alternating stitch, even though I’m making it sound like it could be. 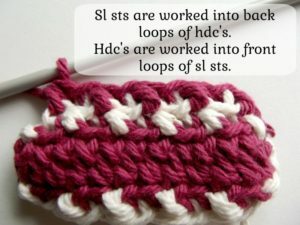 To be honest, I’m not sure if this stitch has a name or not. I’m sure it’s been done before, but I haven’t seen it elsewhere. So if you know the name, please let me know in the comment section below… Thanks so much! First make sure you have a multiple of 2 in the round. 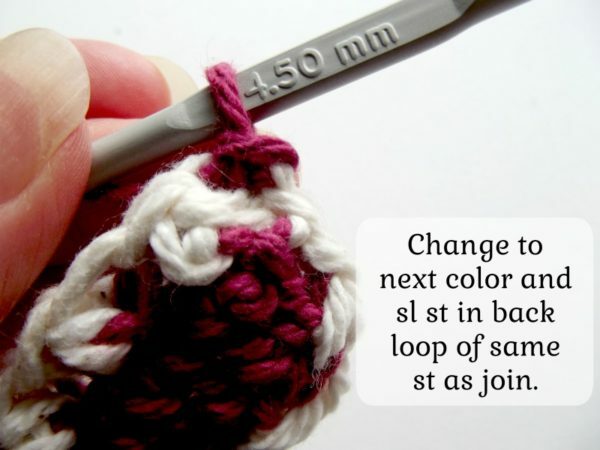 Make a chain 1, then half double crochet into the front loop only of the same stitch as where the join was made. Here you see the first half double crochet completed. Here you see the slip stitch in the back loop of the next stitch. Continue to alternate between the front and back loops. The half double crochets are worked in the front loop. The slip stitches are worked into the back loops. 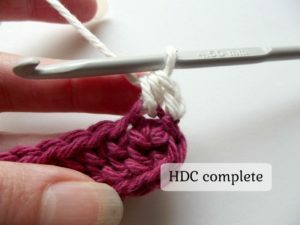 As you can see, this round was started with a half double crochet and is ended with a slip stitch. 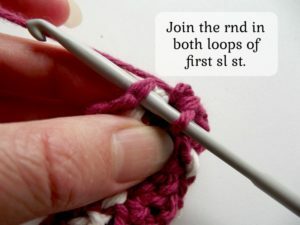 The round is joined with a slip stitch in both loops of the first half double crochet. 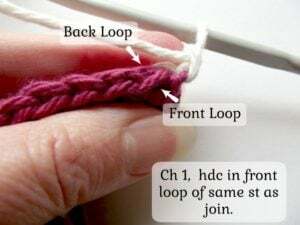 For the next round, change to the next color and slip stitch into the back loop of the same stitch as join. This round is started with a slip stitch and ended with a half double crochet. 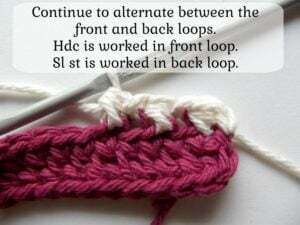 To keep it simple, the slip stitches are worked into the back loops of the half double crochets, and the half double crochets are worked into the front loops of the slip stitches. Again, join the round in both loops of the first slip stitch. And that’s it! Keep repeating the rounds changing up your colors and alternating between the front and back loops. Hope you have fun with it!